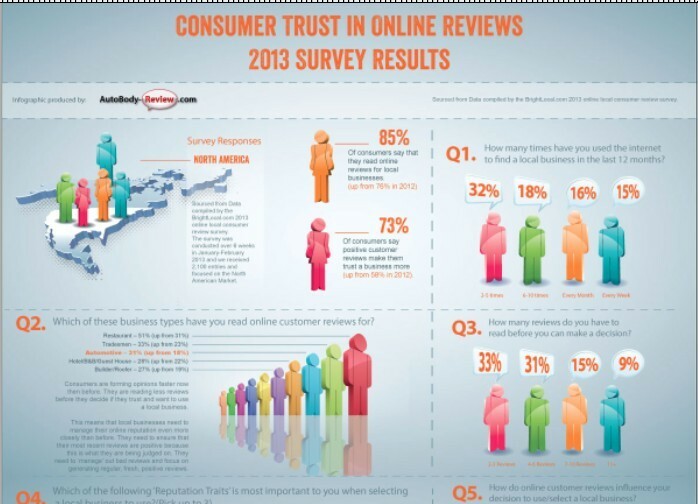 8 in 10 respondents trust online reviews as much as word of mouth recommendations. In a new study posted by brightlocal.com, the necessity for strong online reviews for all local businesses including auto body shops is on the rise. Every year brightlocal.com posts the results to their annual survey focusing on online reviews. This year’s survey focused on the North American market with 90% of respondents coming from the US and 10% from Canada. The survey was conducted over 6 weeks in January-February 2013 and they received 2,100 entries. The survey covered many industries and has a specific category for auto dealers and auto repair shops that we are calling Automotive. There were significant gains over the 2012 survey in several areas. here are a few of the highlights as they relate to your industry the automotive repair market. Also be sure to download our easy to read infographic to see how these results can impact your sales. What it means to your shop: We as consumers, are growing more & more accustomed to consulting reviews, and the availability of reviews for different types of businesses makes it easy. Reading reviews is a logical step in the purchasing cycle which is why 85% of consumers did just this in the last 12 months. Consumers are forming opinions faster now then before. This means that local businesses need to manage their online reputation even more closely than before. Auto body shop’s need to ensure that their most recent reviews are positive because this is what they are being judged on. They need to ‘manage’ out bad reviews and focus on generating regular, fresh, positive reviews. What it mean to your shop: Consumers are becoming more trusting of online reviews and using them to form opinions (positive & negative) about a local business. Auto body shops can’t afford to let their online reputation lie idle or un-managed as a negative reputation will directly impact customer acquisition and ultimately revenue. What it means to your shop: An auto body shop’s reputation is more public and more accessible than ever before. Consumers are able glean a lot from the experiences other customers have and can judge a business before they ever set foot in the door or pick up the phone to call them. This is why trusted review sites such as auto body-review.com are vital to your shops future sales. Our reviews are guaranteed to be authentic since they come from actual customers to your shop. Everything was excellent and Theresa is wonderful ! She explained everything to me and was a sweetie ! Thanks to all involved !